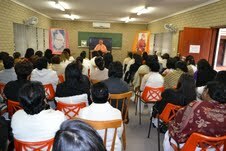 With 9th August being National Women’s Day in South Africa, the Ramakrishna Centre held a special programme for women at the Glen Anil Ashram. Despite the damp weather, approximately 100 ladies enthusiastically attended the programme, which specifically catered for the needs of women. The programme commenced with prayer and the melodious recital in chorus of the Sri Ramakrishna Ashtakam, Sri Sri Sarada Devi Stotram and a hymn to Swami Vivekananda set the tone for the day. This was followed by reading from the Gospel of Sri Sarada Devi done by Arathie Singh . The three Talks presented rejuvenated the spirits of the ladies and inspired them to strive to greater heights for themselves and their families. Revered Swami Vimokshananda, the Spiritual Head of the Centre, in a most methodical, yet elegant manner pointed out that a Mother is not only she who has biological children but anyone who displays the qualities of a mother. This would include young girls and even fathers and unwed men too as the qualities of caring and loving are not exclusively for women. This occasion, he added gave an opportunity to evaluate introspectively how much motherliness could be manifested in one’s life. Revered Maharaj also explained that the vibrations created by the word “ma” play a significant role as opposed to “aunty” in kindling the caring, loving and nurturing qualities of a mother. It is therefore essential that these qualities are instilled and nurtured from childhood and a very effective means of doing so is by addressing every female (from the moment they are born) as “ma”! Sister Avintha of the Sri Sarada Devi Ashram lovingly addressed the ladies on the topic, “Japa – The Repetition of Holy Name according to Sri Sarada Devi”. She highlighted the importance of practicing Japa, and effectively pointed out that “lack of time” should not be an excuse for not practicing Japa as there is no restriction of time and place for the practice of Japa. She showed us how to give practical application of Holy Mother’s message of doing our duties but keep our minds on God by pointing out that one can easily repeat God’s name whilst engaged in daily activities such as cooking, attending to household chores, traveling or even lying down. Mrs Shireen Dhunraj pointed out the realistic challenges faced by working women and highlighted the importance of having coping skills. She warned of the dangers of “burn out” and stressed the need to maintain a balance in life. She advised that to this end, spiritual practices such as Japa and meditation and attending satsang and keeping holy company, play a significant role. A DVD on Jayrambati – the birth place of Holy Mother, Sri Sarada Devi, was aired. It was an excellent documentary that immediately transported everyone to Jayrambati through the beautiful narration, music and visuals of Mother’s actual homes, the ponds, rivers and pilgrims. From the question and answer session it was evident that the ladies were deeply inspired and motivated to implement all that they had learnt. Apart from Swami Vimokshananda, Mrs Sita Gangay, Mrs Shireen Dhunraj and Sister Avintha also answered some questions. 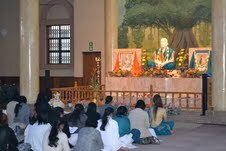 The programme ended with closing prayers and followed by prasad in the form of lunch to all. Thank you so much for posting the proceedings of Women’s Day. The review by Inderani Basdeo Is very inspiring. I wish I was in Glen Anil Ashram. My Pronam to Srimat Maharaj! 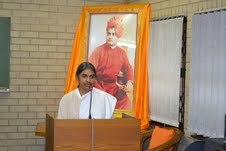 As we are the Devotees of Thakur, Ma and Swamiji – this message of South Africa is very enjoyable to us. Happy to know that you enjoy the posts in this blog! Your feedback is most welcome! There are hundreds of devotees who read and tell me later that they enjoyed but very shy of writing the same in Comment section! As an author of the blog, I encourage people to write comments and this inter-action gives me lots of ideas too. May Mother’s blessings be with you! It is indeed wonderful to have you back on the net. We all had missed you here(net) for almost 2 months. Hope everything was fine by the grace of Bhagawan Sri Ramakrishna. Your views on motherliness being attributed to motherhood on National Mother’s Day in SA was unparallel and so unique. Thanks for your feedback! I am moved to know that you have been ‘missing’ me in the Net. Though I do wish to write at least once in a week on some subject, yet my other preoccupation does not allow me free time especially when I move from place to place. And not ‘unoften’ the proverbial ‘writer’s block’ also is a culprit! Above all, I look to Mother’s grace! May Holy Mother be with you and family! Thank you for sharing this lovely and inspiring information. With pronam to Sri Thakur, Sri Maa and Swamiji. May Mother be with you! I agree. The phonetics involved in uttering the word ‘MAA‘ is heart-rendering. I like it in Botswana – all ladies are addressed as ‘Maa‘. I saw it personally when I was in Gaborone recently. And thanks for your active help in serving the poor there. I read an article that appeared a month back in Prabuddha Bharata, our English monthly Journal brought out from Mayavati, Himalayas. This was written by a lady who discovers what potentiality this very word ‘Maa” has. An excellent article! May the Holy Mother be with you!